The iconography on this ticket is the “President’s House” on Ninth Street, the University of Pennsylvania’s home, 1801-1829. Built in 1790, it was intended for, but never used as the United States President’s residence. 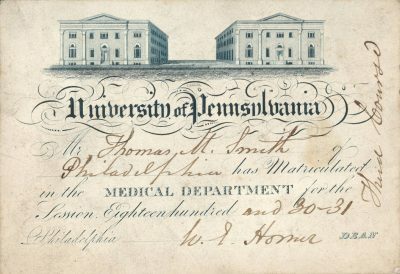 Penn added the left wing for the expanding Medical Department in 1806-07. 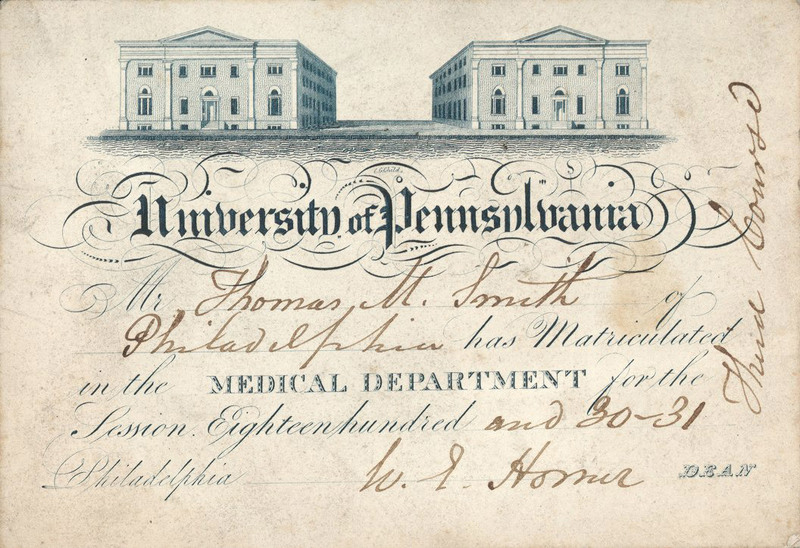 Horner apprenticed with a Virginia physician before attending Penn. He took a leave of absence during the War of 1812 to serve as surgeon’s mate in charge of an Army hospital near the Canadian border. He completed his Penn medical degree in 1814, returned to military service and then in 1816 began his teaching career as dissector under Caspar Wistar, MD (13). During an interlude in 1821 Horner studied advances in pathology in France; he later wrote the first American textbook on pathological anatomy and became one of the nation’s preeminent anatomists. Horner served as dean of the Medical Department (1822-1852) and professor of anatomy (1831-1853). Duffield (Penn; M1829) briefly operated a drug store in Philadelphia; he died in 1830. Gross, Samuel D. Lives of Eminent American Physicians and Surgeons of the Nineteenth Century. Philadelphia: Lindsay & Blakiston, 1861. 697-721. University of Pennsylvania Archives and Record Center, Alumni Records. William Edmonds Horner, 1793-1853, Papers, 1821-1969. University of Pennsylvania Archives and Record Center. 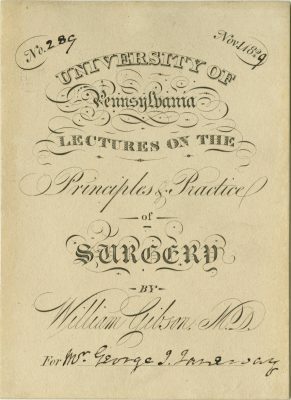 Gibson took courses at Penn but received his medical degree at Edinburgh in 1809. A native of Baltimore, he returned there to practice and helped establish a medical department at the University of Maryland (63), where he was appointed professor of surgery at age 23. 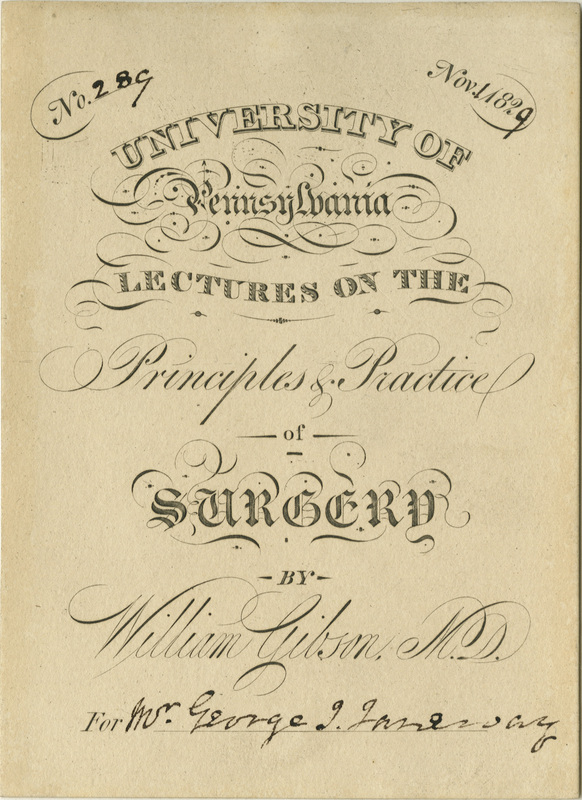 Gibson succeeded Physick (45) as Penn’s professor of surgery (1819-55). He paid a living model $20 a year – out of his lecture fees — to teach students how to apply bandages and surgical dressings. Noted for his surgical accomplishments, Gibson was the first surgeon to attempt ligature of the common iliac artery and performed two successful Caesarian sections on the same woman. Janeway (Penn; M1830) became a practicing physician and one-term mayor of New Brunswick, NJ. Perhaps his most noteworthy contribution to medicine was insisting that his son, Edward G. Janeway, MD, attend medical school instead of business school. With William H. Welch, the younger Janeway co-founded and directed the first pathological research laboratory or “Carnegie Library” at Bellevue Medical College and identified “Janeway lesions” in some cases of infective endocarditis. Corner, George W. Two Centuries of Medicine: A History of the School of Medicine, University of Pennsylvania. Phila: J.B. Lippincott Company, 1965. 69-70, 75. NYU Department of Pathology Notable Alumni. Prutkin, Jordan M., MD, MHS, and W. Bruce Fye, MD, MA. “Profiles in Cardiology: Edward G. Janeway, Clinician and Pathologist.” Clin. Cardiol. 29, 376-377 (2006). Rutkow, Ira M., MD, MPH, DrPH. “William Gibson (1788-1868).” Arch Surg. 2000;135(6):743. 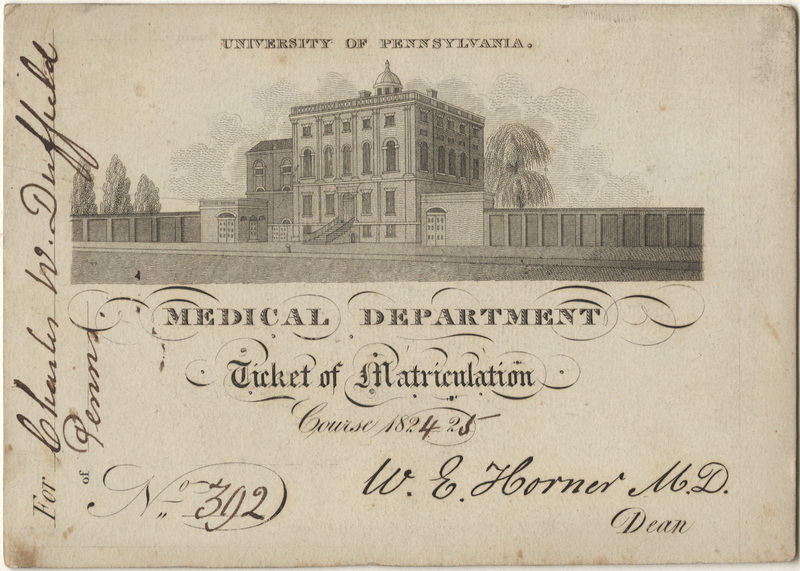 Dean Horner (77) issued this matriculation ticket shortly after the University moved into these new twin buildings on the Ninth Street site of the former “President’s House”. Architect William Strickland designed the buildings, one for the Medical Department (left) and the other for the College (right). 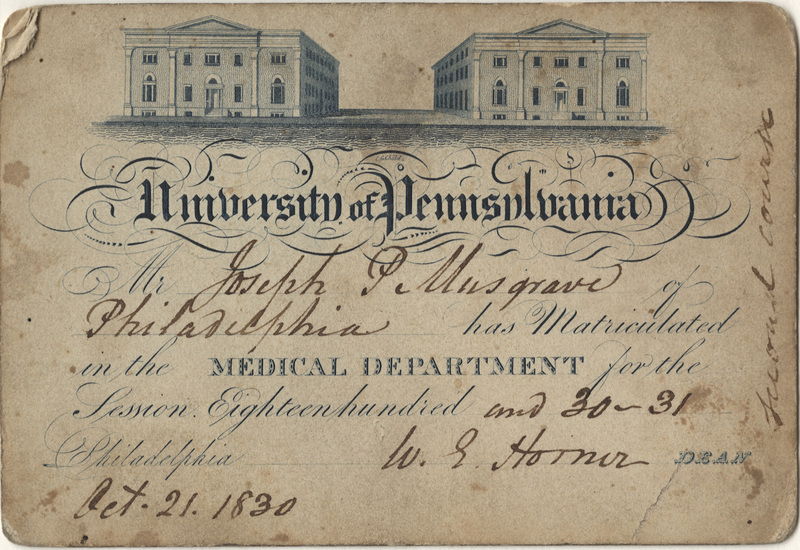 After graduation, Musgrave (Penn; M1831) of Pennsylvania continued to attend courses in the University’s Medical Department. In 1831-32 he was one of 35 students (nine percent) enrolled in a class of 390 who already held a medical degree. That 31 of those 35 were Penn medical alumni with legitimate medical diplomas suggests that they attended for postgraduate or continuing medical education, versus “MDs” without formal medical training seeking to augment their knowledge. Catalogue of the Officers and Students of the University of Pennsylvania. Philadelphia: January, 1832. Corner, George W. Two Centuries of Medicine: A History of the School of Medicine, University of Pennsylvania. Phila: J.B. Lippincott Company, 1965. 75-76. Collection 1978, Hopkinson Family Papers, 1736-1841. The Historical Society of Pennsylvania. Gross, Samuel D. Lives of Eminent American Physicians and Surgeons of the Nineteenth Century. Philadelphia: Lindsay & Blakiston, 1861. 706-07. Corner, George W. Two Centuries of Medicine: A History of the School of Medicine, University of Pennsylvania. Phila: J.B. Lippincott Company, 1965. 54. 70, 82-85. Kelly, Howard A. and Walter L. Burrage. American Medical Biographies. Baltimore: The Norman Remington Company, 1920. 254-55. University of Pennsylvania Archives & Records Center. Penn Biographies, John Redman Coxe (1773-1864). 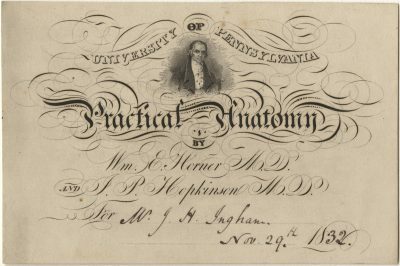 Jackson (Penn; M1808) wrote his thesis on “Suspended Animation,” foreshadowing a long academic career in physiology — virtually synonymous with “the institutes of medicine.” After serving in the War of 1812, he entered private medical practice. When Philadelphia suffered yet another yellow fever epidemic in 1820, Jackson chaired the Board of Health. 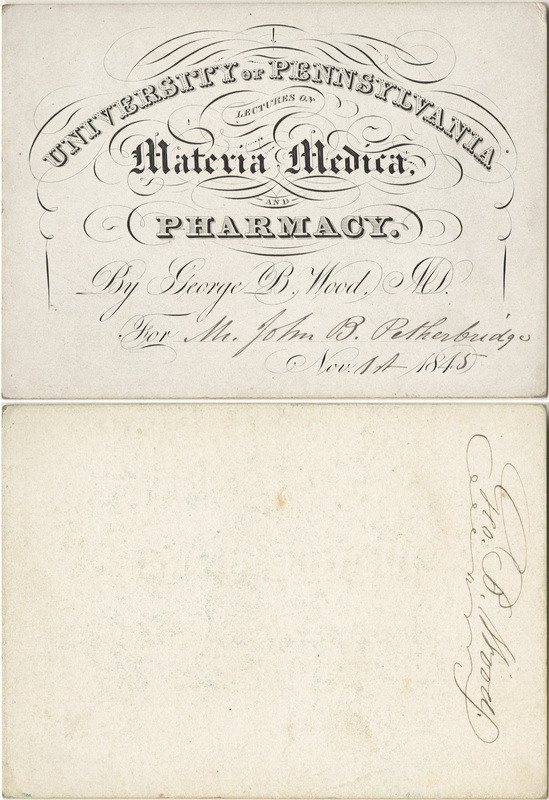 In 1821 he helped found the Philadelphia College of Pharmacy (46) and became its first professor of materia medica. Jackson also taught materia medica, as well as medical chemistry, at the Medical Institute of Philadelphia (36). 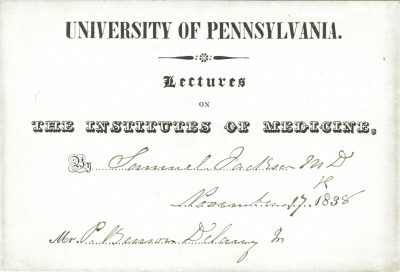 He started teaching physiology at Penn in 1827 as assistant to Chapman (72) and succeeded him as professor of the institutes of medicine (1835-1863), delivering his last lecture at age 76. Delany (Penn; M1840), a native of Delaware, studied medicine at Yale prior to matriculating at Penn. He served as an assistant surgeon in the US Navy during the Mexican-American War and died in South America in 1847, just seven years after his medical school graduation. Kelly, Howard A. and Walter L. Burrage. American Medical Biographies. Baltimore: The Norman Remington Company, 1920. 604. Lippincott, Horace Mather. The University of Pennsylvania, Franklin’s College, Being Sole Account of Its Beginnings and Development, Its Customs and Traditions and Its Gifts to the Nation. Phila: J.B. Lippincott Company, 1919. 212. Morgan Library of Ohio Imprints, Student Name Index Project, Medical Preceptors to 1899. University of Pennsylvania Archives & Records Center. Penn Biographies, Samuel Jackson (1787-1872). Hodge apprenticed with Wistar (13), received his Penn medical degree in 1818 and during Horner’s (77) 1821 European trip, filled in at Penn as lecturer in anatomy. He soon taught surgery at the Medical Institute of Philadelphia (36), attained positions at Philadelphia dispensaries and hospitals, and developed a surgical practice. Failing sight caused him to switch to obstetrics. 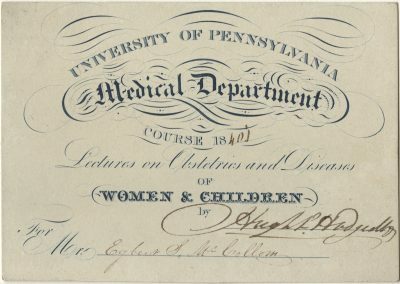 In 1832 he served as physician-in-charge of Pennsylvania Hospital’s lying-in department and two years later succeeded James (70) as Penn’s professor of obstetrics and diseases of women and children. Hodge pioneered techniques and medical instruments for obstetrical and gynecological care, including a forceps and a pessary that bear his name. Though his vision deteriorated to the point where he resigned in 1863, with the help of his sons he authored the widely acclaimed textbook, Principles and Practices of Obstetrics. 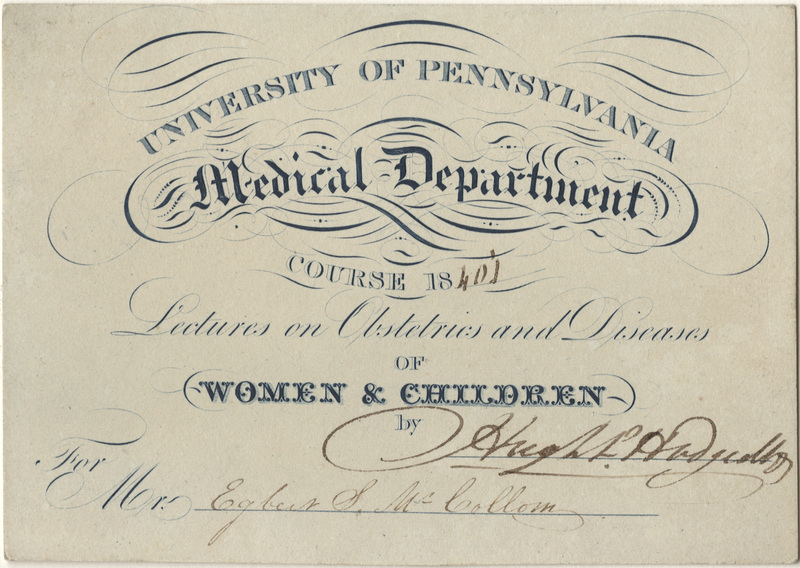 McCollom, from Norristown, PA, matriculated at Penn in 1838-39 and 1840-41, but did not graduate from the Medical Department. Goodell, William, MD. Biographical Memoir of Hugh L. Hodge, MD, LLD. 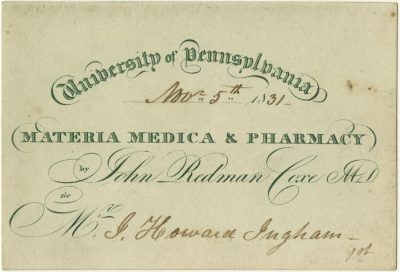 Phila: Philadelphia County Medical Society, 1874. University of Pennsylvania Archives & Records Center. Penn Biographies, Hugh L. (Hugh Lenox) Hodge (1796-1873). 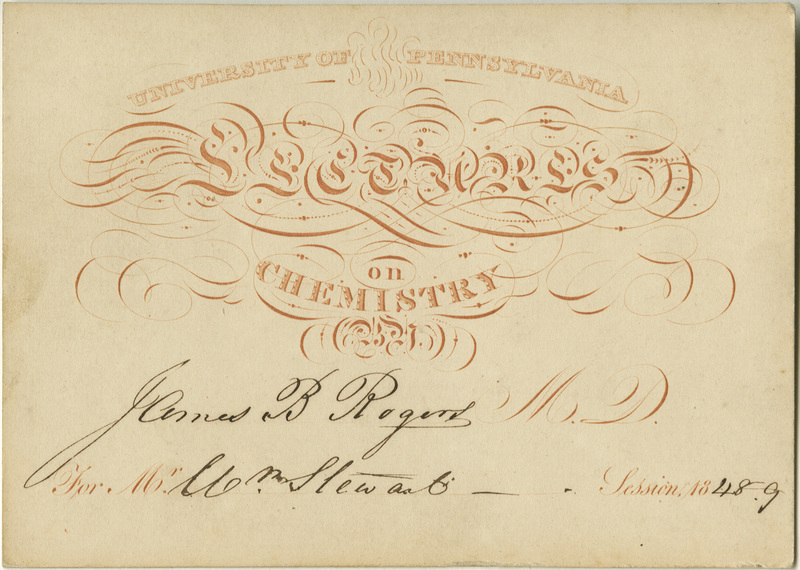 Wood (Penn; M1818), a founder of the Philadelphia College of Pharmacy (46), its first professor of chemistry and later materia medica, joined Penn’s faculty in 1835. He brought back basic science into a curriculum that emphasized medicine and clinical practice. In 1865 he generously endowed the Auxiliary School of Medicine with five chairs: botany, hygiene, geology, comparative anatomy and zoology, and medical jurisprudence. 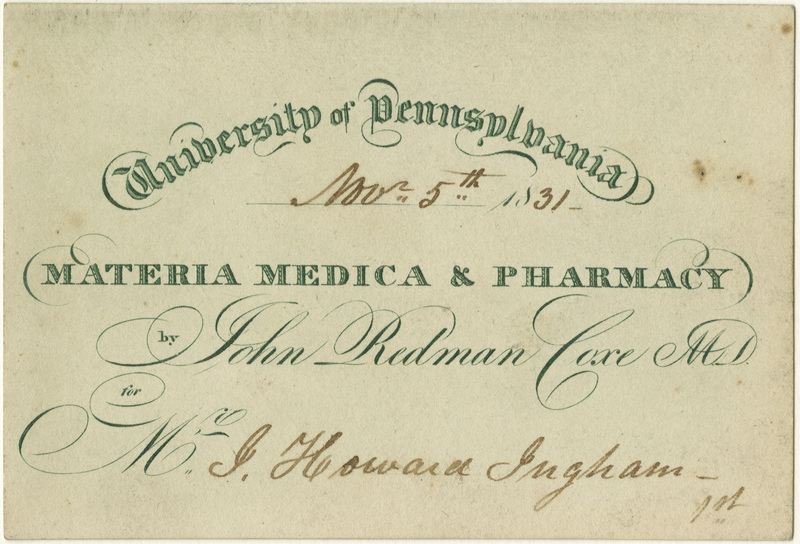 These were Penn’s first faculty paid fixed salaries rather than lecture fees, a decade before the entire Medical Department underwent reforms. Wood, along with Franklin Bache, MD (32), authored The Dispensatory of the United States of America (1833), edited and published for more than 100 years. Medical schools in the US and abroad, including Edinburgh, adopted his seminal text, Practice of Medicine (1847). During the 1850s Petherbridge (Penn; M1847) resided in Hoboken, New Jersey. During the Civil War, he crossed the Hudson River to join the 65th NY Volunteers, mustering out in 1865 as Surgeon and Brevet Lieutenant Colonel. Corner, George W. Two Centuries of Medicine: A History of the School of Medicine, University of Pennsylvania. Phila: J.B. Lippincott Company, 1965. 68. Hartshorne, Henry, AM, MD. “Memoir of George B. Wood, MD, LLD.” Proceedings of the American Philosophical Society, Vol. 19, No. 107 (Mar.-Dec. 1880), 118-152. Heitman, Francis Bernard. Historical Register and Dictionary of the United States Army from Its Organization, September 29, 1789, to March 2, 1903. Vol. 1. 140. 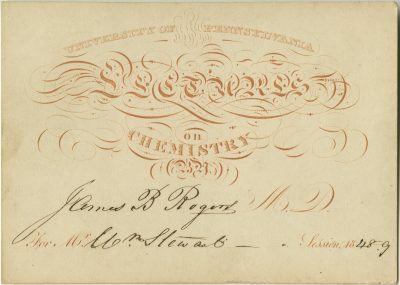 Rogers (U. of Maryland; M1822) started medical practice in Maryland, but preferring the pursuit of chemistry took a job as scientific superintendent at the Baltimore Chemical Works. Ailing from exposure to environmental toxins, Rogers received timely offers from academia. He taught chemistry in Washington Medical College of Baltimore and chemistry and pharmacy at the short-lived Cincinnati College of Medicine. 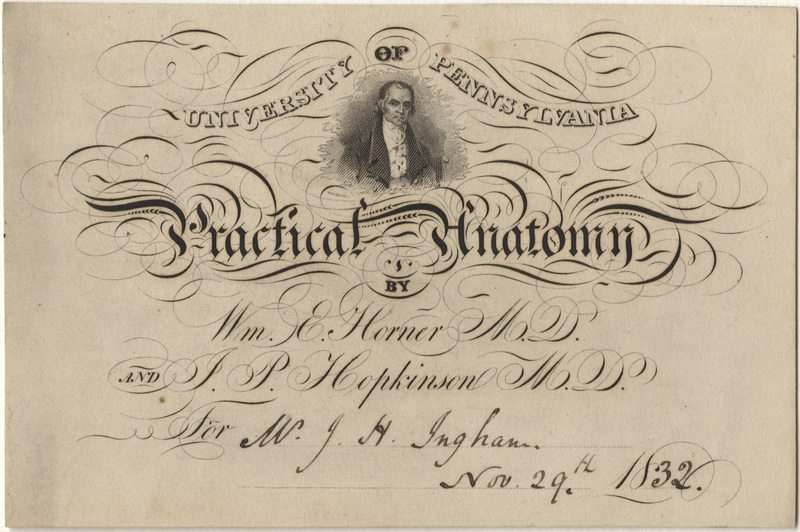 Around 1839 he moved to Philadelphia and offered private instruction to medical students. 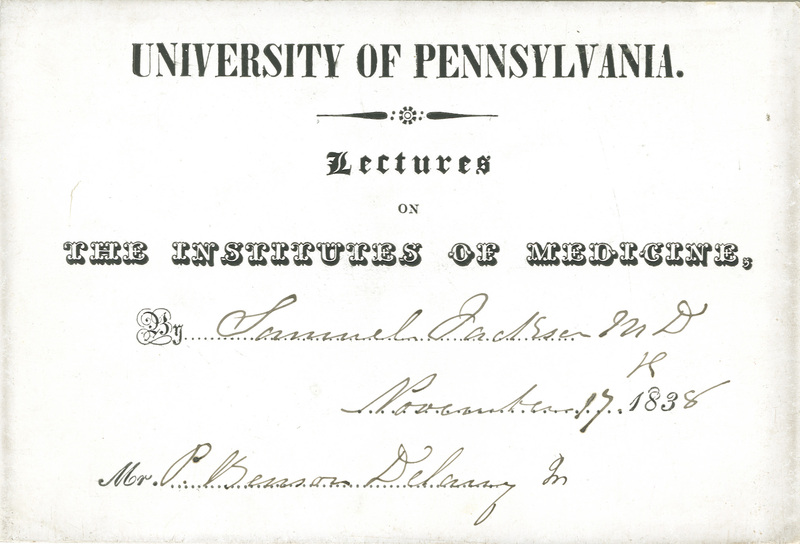 His prowess as a lecturer earned him entrée into the Medical Institute of Philadelphia (36), the Franklin Institute and in 1847, the University of Pennsylvania. Rogers, with brother Robert E. Rogers, MD (Penn; M1836) (94) who succeeded him as chair, introduced organic and physiological chemistry into the curriculum, replacing inorganic and elementary pharmaceutical chemistry. 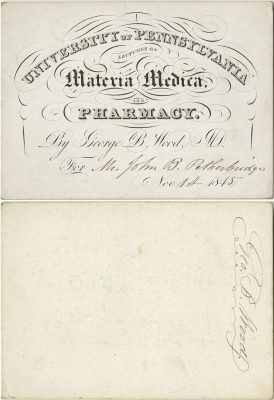 Stewart (Penn; M1850), perhaps inspired by Rogers’ teaching, worked as a druggist and “pharmaceutist“ in Princess Anne, MD. Carson, Joseph, MD. A Memoir of the Life and Character of James B. Rogers, M.D., Professor of Chemistry in the University of Pennsylvania. Phila: T.K. and P.G. Collins, Printers, 1852. Corner, George W. Two Centuries of Medicine: A History of the School of Medicine, University of Pennsylvania. Phila: J.B. Lippincott Company, 1965. 102. The State Gazette and Merchants and Farmers’ Directory for Maryland and District of Columbia. Baltimore: Sadler, Drysdale & Purnell, 1871. 702.